Moving House With A Toddler. I’m not going to lie, one of the things I was most worried about when moving house was Archie. How was he going to cope? Would he settle in ok? How would we move everything in without him getting in the way? What would he be like just having his Mummy and Daddy around instead of his Nanny, Grandad and Aunties? It turns out I had nothing to worry about at all. He was absolutely amazing during the whole process. He took to our new house like a duck to water. My heart burst with pride with how well he has coped with it all. He has only just turned two and everything he knows has been packed up and moved into a new house, with less people and a lot less noise. 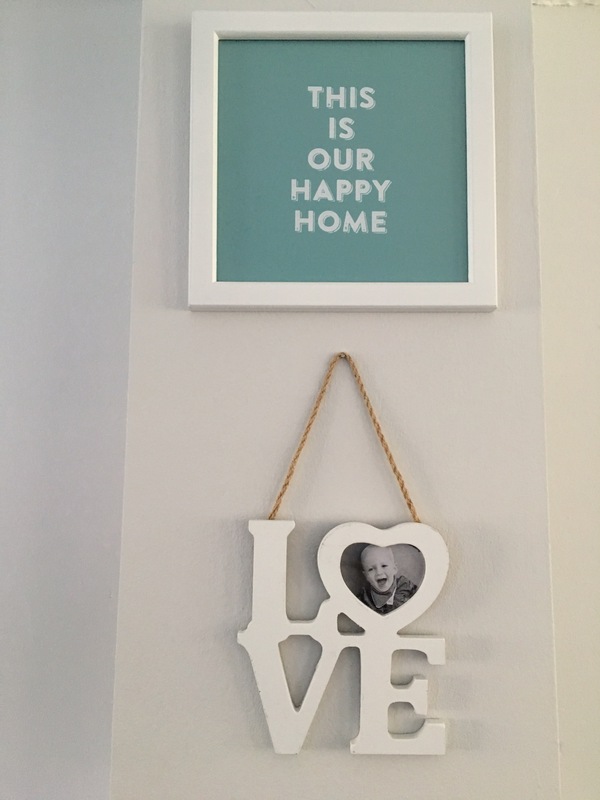 Since we bought the house he has been to it a couple of times and we have explained that it is going to be a new home for Mummy Daddy and Archie. Every time we have brought him to the house he has been so excited and not wanted to leave. 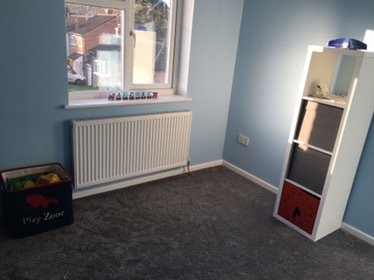 We showed him the house when we first got the keys, a couple of times whilst we was replastering and painting and then finally when the carpets were laid before all the furniture was brought in we showed him his new bedroom. On our first day moving into our new house, I hosted a baby shower for one of my best friends and then went to the cinema with my sister so unfortunately I wasn’t there to bring Archie back to it and to help put him to bed. After the baby shower I came back to our house and Archie was SO excited to be there, he was running around opening all the boxes and having the time of his life. Once I went back out Daddy nailed bedtime, Archie went straight down and straight to sleep. He seemed so settled in his new bedroom. Since moving in we haven’t had any problems with Archie. He in absolutely besotted with his bedroom. When living at my mums house both Callum and I shared a room and Archie shared a room with my sister who lives away at Uni, so one end of the bedroom was hers and the other was his. There was never really enough room for him to run around in it and get his toys out so I think he is just enjoying having his own space. He wont bring his toys downstairs and play he just loves playing upstairs with them all, emptying every toy box and spreading them all out. 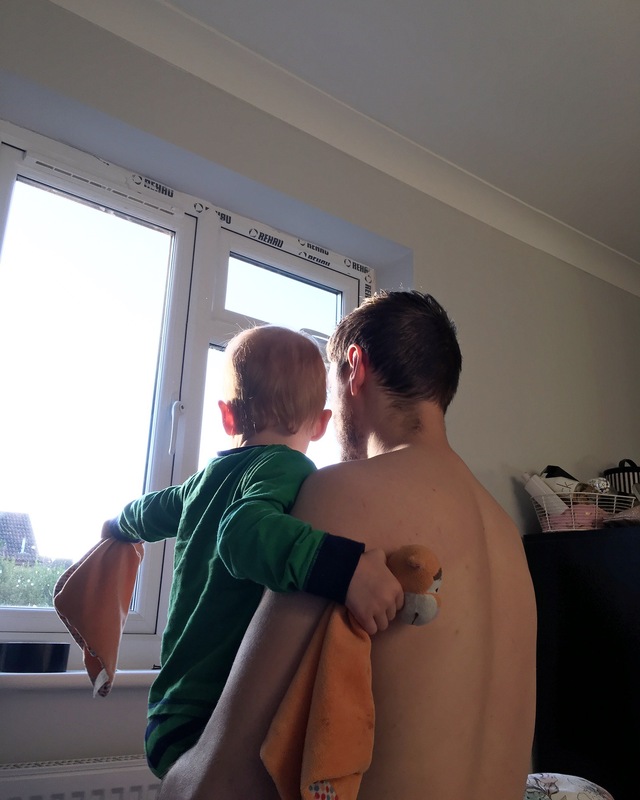 Its so lovely to see him so settled and love our family home as much as Callum and I do. I cant wait for us to get some warmer weather so we can start tackling the garden and making it a safe place for him to enjoy too. Thank you all for reading. I hope if any of you are moving house soon with little ones then this gives you the peace of mind you need. I know it was an extra stress for me with moving wondering how Archie was going to cope but I needent have worried at all. And just like that we’re in. Our little family home. To say this week has been stressful would be an understatement. After 9 weeks of hard hard work. And a week of moving furniture, belongings, building flat pack, sorting and cleaning. We’ve done it. We’re in. Just in time for Mothers Day. Thing are still all up in the air, boxes still need to be unpacked. We need to find homes for everything. Shelves need to be put up and everything needs a sort through. But we’re in and I can’t even begin to explain how excited I am. Our first family home. 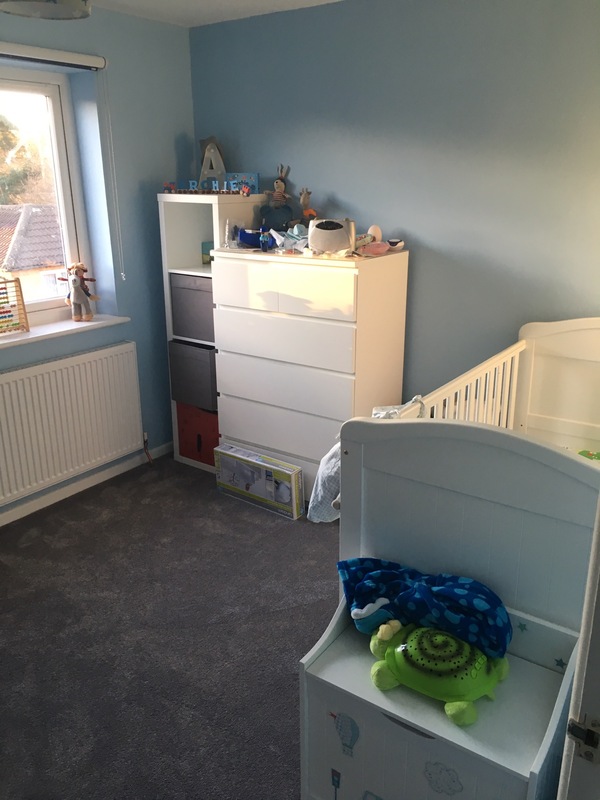 Where we can make memories with our little boy. I’m going to do before and after shots of each room but not until we’ve got shelves and photos up ect. So thy might take a couple of months for everything to settle. But here are some photos of where we’re at so far. I can’t even begin to tell you how much this excites me. The difference carpets makes is amazing. It is actually starting to look more and more like a home rather than an ongoing project now. We have also had the rest of our bathroom fitted so we finally have a working bath toilet and sink!! 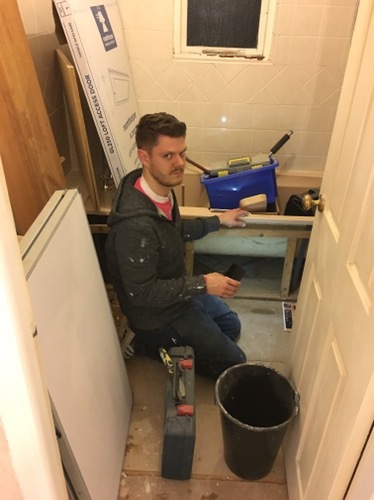 We haven’t done anything with the bathroom as of yet apart from completely tear up and relay the floor boards, fix a leak and change the bath toilet and sink. We’re hoping to re tile it later on in the summer so for now we’ve just got the broken tiles that was here when we bought the house and an off cut of carpet to line the floor. Whilst the carpet fitters were fitting our carpet, I took the opportunity to start tacking the garden and all the over grown half dead trees that are scattered through out our garden. I managed to tear down two trees (just leaving a stump) with my bare hands and a crappy pair of securters from Poundland. Just by taking out these little trees, it has already opened up the end of the garden a lot. 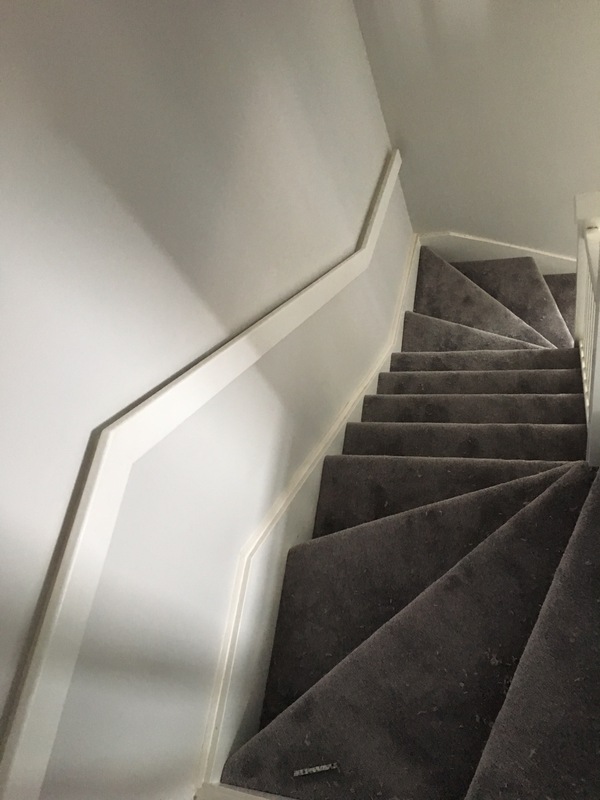 Unfortunately the carpet fitters can broke down the morning of our fitting so we had to wait for another fitter to be free to come to us so they could only fit the rooms to start so we’ve had to wait until the end of the week to get the stairs and landing fitter. 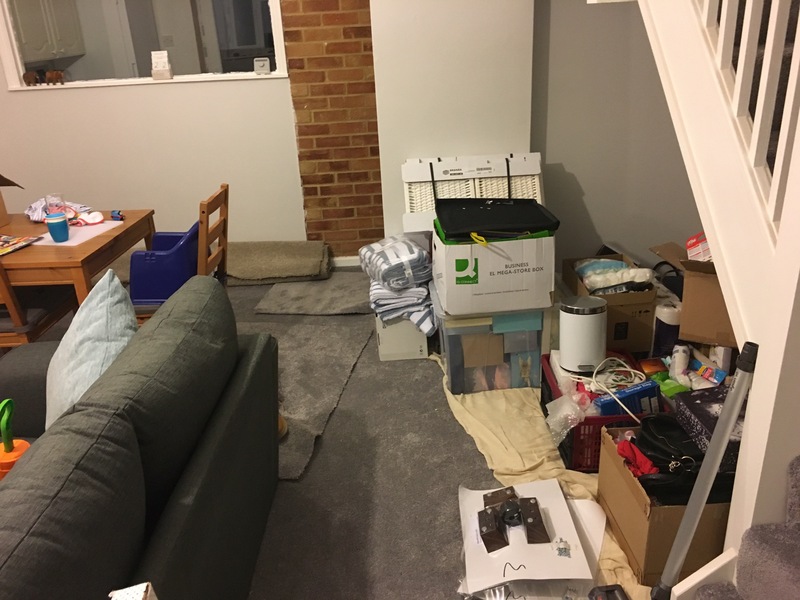 Now that the carpet is in, we can finally start bringing over some of our furniture and building the smaller bits here getting it ready to move in. We’re hoping we will be in by next week so going to try and bring things over in stages rather than all at once. This bit has by far been my favourite stage. 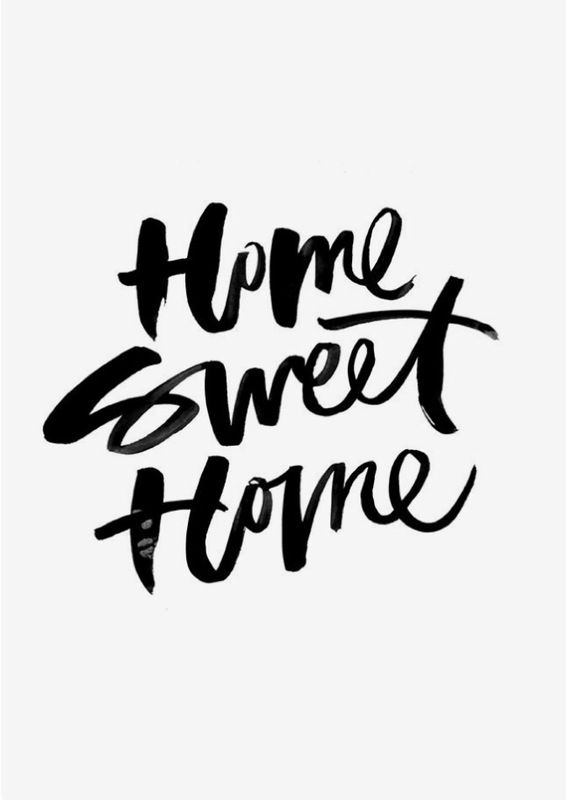 We’ve started making it look and feel like a home and the end is in sight. I just can’t wait to move in and be living here now!! The next update will most likely be one saying we’re in!!! So if any of you have any tips and tricks for moving they would be greatly appreciated. This is the week where significant things have taken place. It has been the week of panic. 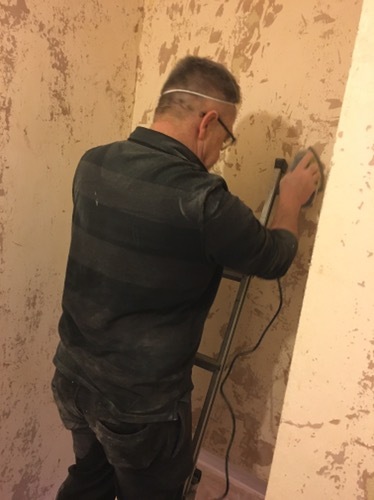 Next week we are having our carpets fitted so we have been running around trying to get everything done that needs to be done before the carpets go down. A massive thing that happened this week was we got our new windows and doors fitted and they look amazing. I can’t believe how much brighter the house is with white windows apose to brown!! 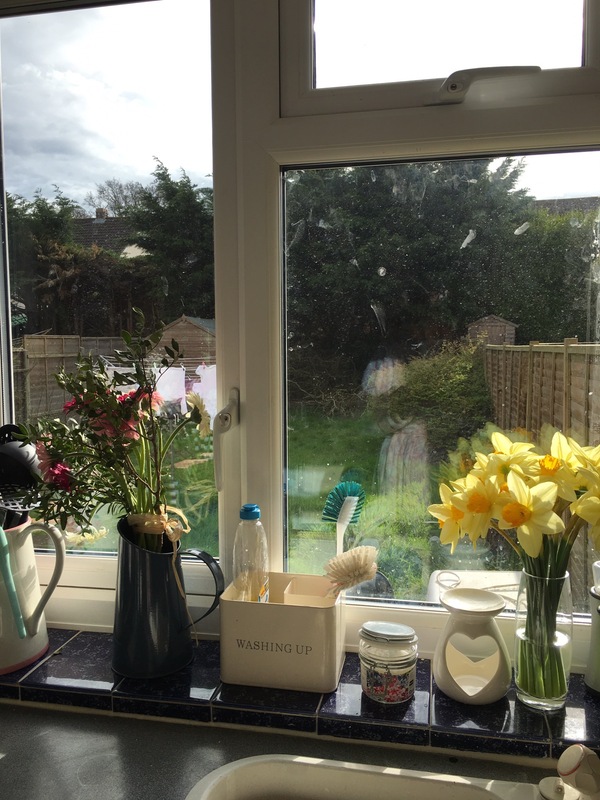 Not only does the colour of the windows make a dramatic difference, but having double glazing spouse to single glazing is amazing. It blocks out so much noise (not that our tiny cul-de-sac is noisy) and keeps the house toasty warm. 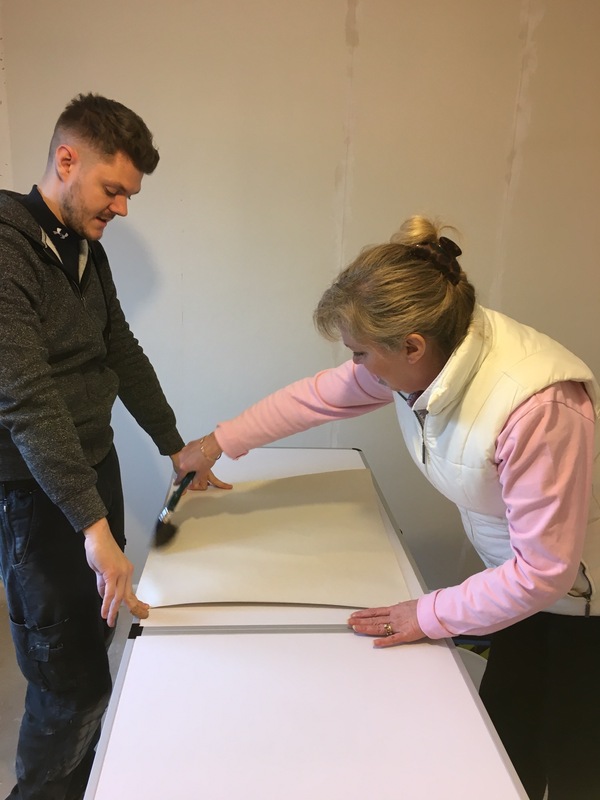 We have had to have the frames round the windows and doors replastered as they got damaged taking the old windows out so we have now got a lot of painting to do touching up around those areas. I have mainly focussed on getting the odd bits and bobs sorted in time for carpets. Plug sockets changed, new sockets installed, painting finished and holes filled. All these things have been very fine consuming. 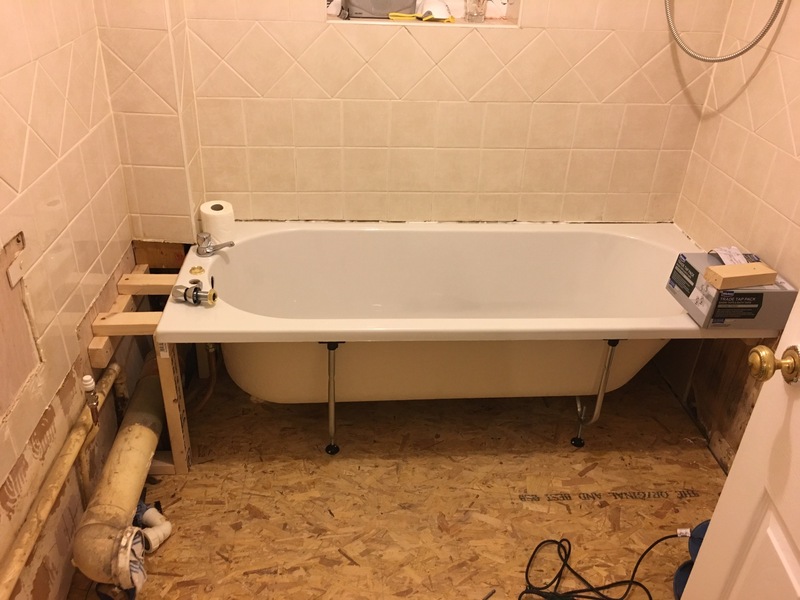 Another huge thing that has happened this week is we have had our bath installed in our bathroom. 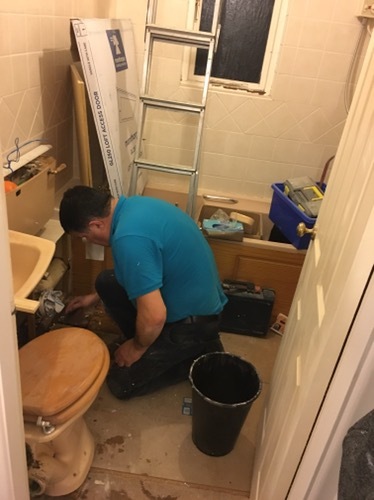 Unfortunately it was a bigger job than first thought so the toilet and sink are getting installed the beginning of next week but we finally have some of our bathroom put back together. It has been a busy busy week but by next week when we have carpet down it is going to be oh so worth it. How has it been 6 weeks since we got the keys to our house. In some ways it feels like we haven’t done a lot to it in that period of time and in others it feels like we have done so much. This week things have really started taking shape. 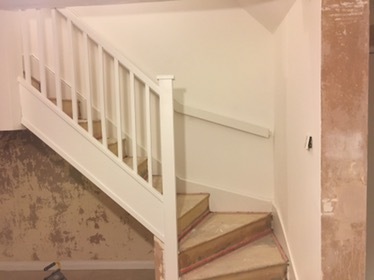 Now that the bedrooms are finished we have been able to work on the landing and down the stairs. 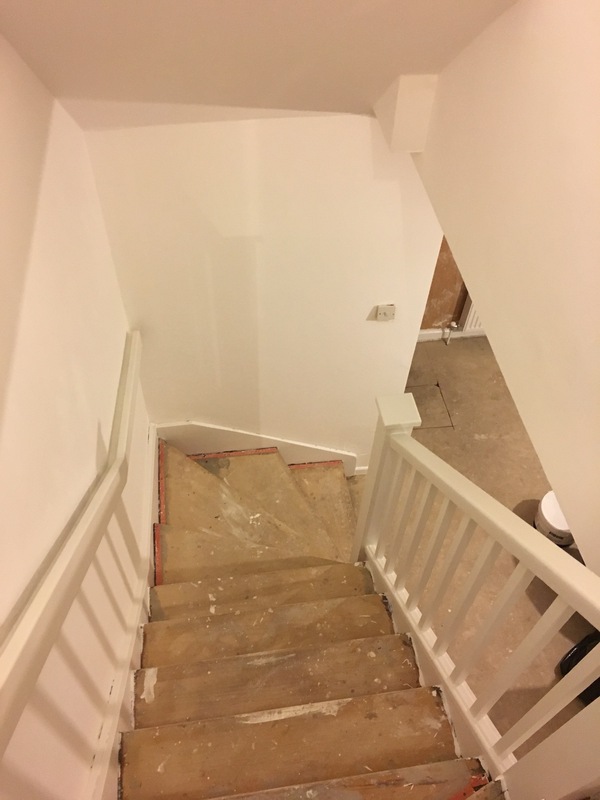 Having the first coat on the stairs has made a massive difference. 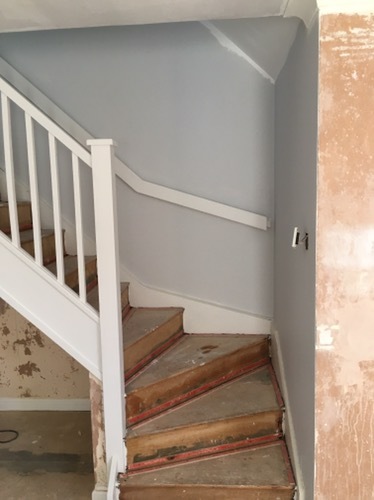 Not only is he banister now all painted white, the walls have their first coat of grey on and it really gives us an idea of how the end result is going to look. 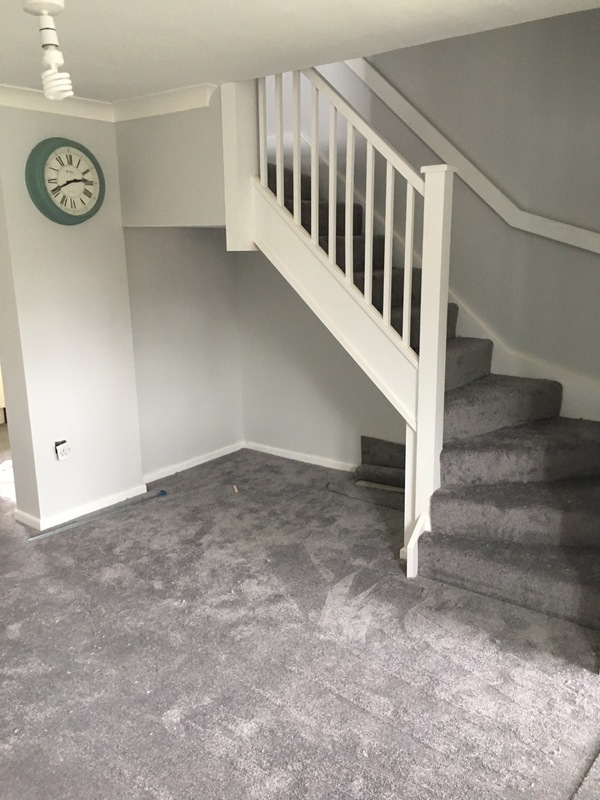 We had the man round to measure the house for carpets this week so we have been able to order the carpets and set a date for them to be fitted (less than two weeks. Can you believe it). 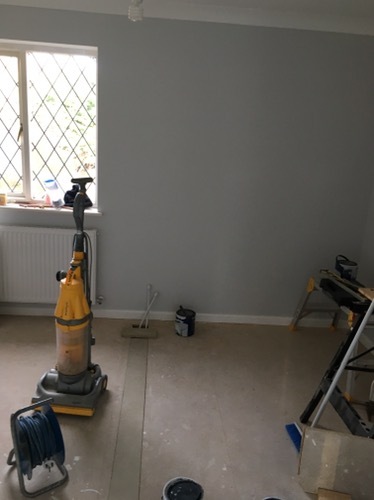 I cant wait for carpets to be in, it will really transform the house and we will be able to start getting some of the bigger furniture into the rooms that are finished. 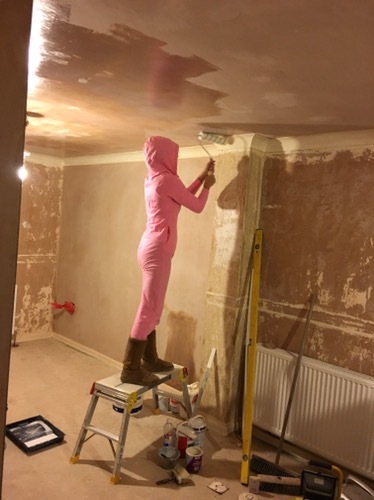 At this stage I’m a little bit worried that were not going to have everything done in time for the carpets to be fitted but we shall just okay it by ear. 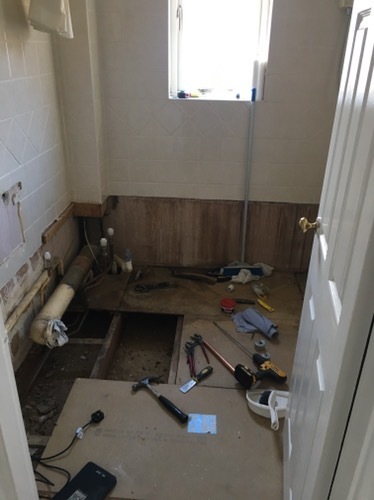 Towards the end of this week, the entire bathroom got ripped out and the flooring put back down as the old flooring had gone rotten and started to crumble. We have bought a whole new bathroom suite and hopefully that will get fitted next week. Unfortunately the windows aren’t in yet like I had hoped but they are getting started Monday. Next week is a big week for things to be done as it’s the last full week my parents are here before they go to Australia for nearly a month. Not only is my Dad a massive hep with decorating our place, but my Mum has Archie so I can go over and paint. Sorry here hasn’t been much to report this week, that dodgy bathroom has taken up a lot of the week. Next week we will have new electrics windows and hopefully a painted living room. 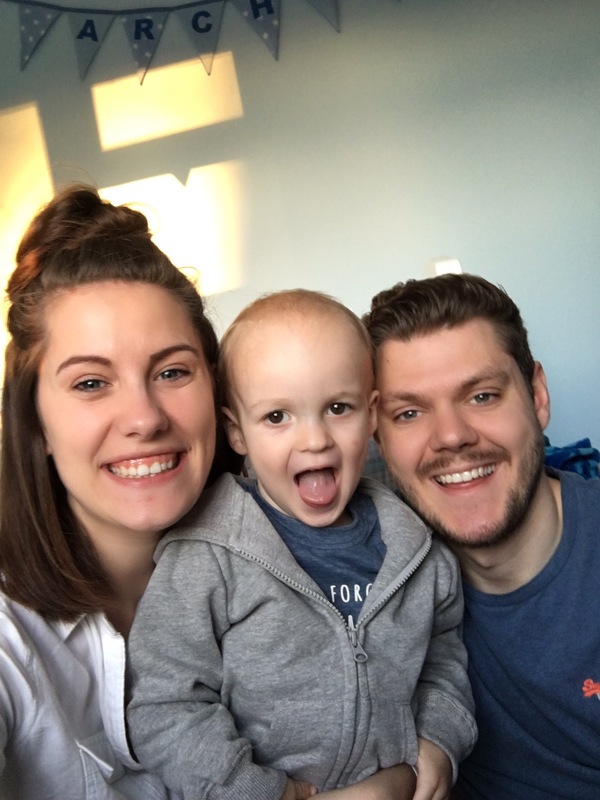 A letter to Archie on his 2nd Birthday. 2 whole years ago you came into my life, turned my whole world upside down. Taught me how to love, treasure and care for you. Taught me how to be selfless, to grow and to be strong for you. You gave me a meaning to my life. A purpose. Nothing in the world means more to me than you do. I love everything about you. Your smile, your laugh, your dimples, your big brown eyes, the way you wrap your arms around my neck and tell me you love me. You give me the drive to succeed and the will power to work hard. Your the reason I wake up with a smile on my face and the reason I’m exhausted at the end of each day. You mean the absolute world to me little one and I am forever eternally grateful that you came into our lives. I can’t believe I have a 2 year old. I’m just as emotional as I was on his first birthday. I just can’t believe how grown up he is, he’s a full blown little boy now, no longer a baby. His speech is absolutely amazing I cant get over how many words and phrases he says. 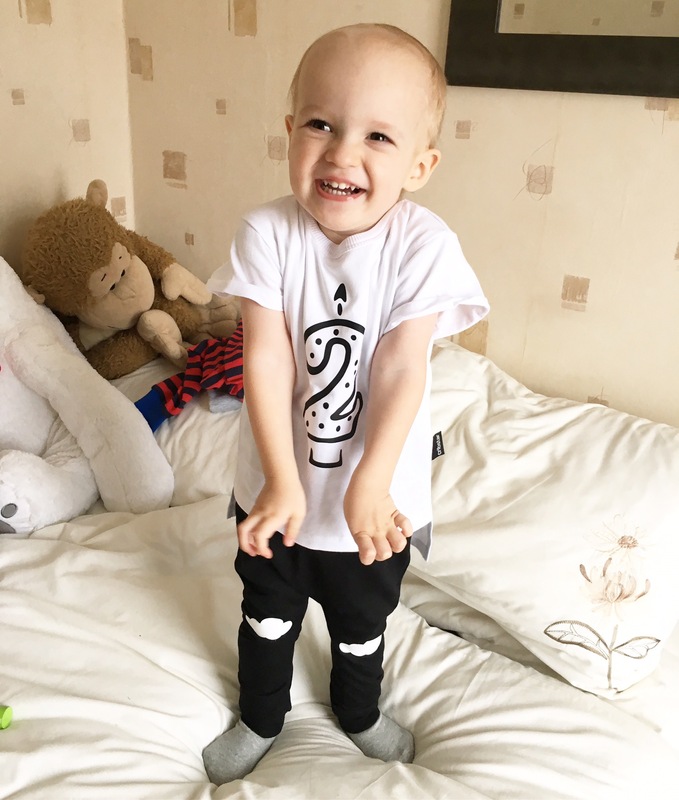 He can count to 7 without needing prompting (and sometimes 10), tell you all his body parts, primary colours, name 20 or more different animals and their sounds they make and is just generally an all round loving kind little boy. He eats me out of house and home and is growing like there’s no tomorrow. He is in size 2-3 mostly not but still fits in a lot of his 18-24 month clothing and his feet are now a whopping size 7F. He is such an inquisitive, adventurous little boy. He loves nothing more than exploring the great outdoors whether that be on a walk or on his scooter. He is definitely a boys boy. Loves playing in the dirt, climbing things and kicking a ball about. This week we have handed in his application form to start pre school in September. I can’t believe I actually have a 2 year old and in 6 months he is going to start pre school. When did my baby grow up and get so big. He makes me so proud every day. I can’t shout his praises loud enough. I want everyone to hear about him, be around him and witness the fun and joy he brings. He truly is a loving thoughtful little boy and I’m so proud that I am his Mummy. Happy 2nd Birthday Archie. I hope your day is as special as you are. I feel like we are finally getting somewhere with the house. It is actually starting I look like everything is coming together now. 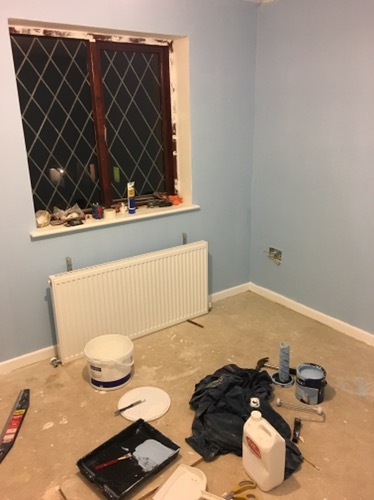 Over the weekend we have managed to get both our bedroom and Archie’s bedroom coated in undercoat and then finally got all the walls painted the colours we want them. Apart from adding electric sockets here and there these rooms are pretty much finished now until we get the carpet laid. The hall way has been completely sanded down and the walls and ceiling are now ready to be undercoated. The banister is completely sanded down and is now a lovely white rather than a dark brown wood. It is unbelievable how much it has opened the room up and how much more light reflects around the room. I’m so happy with the progress so far. This week has mainly been a week of buying things. 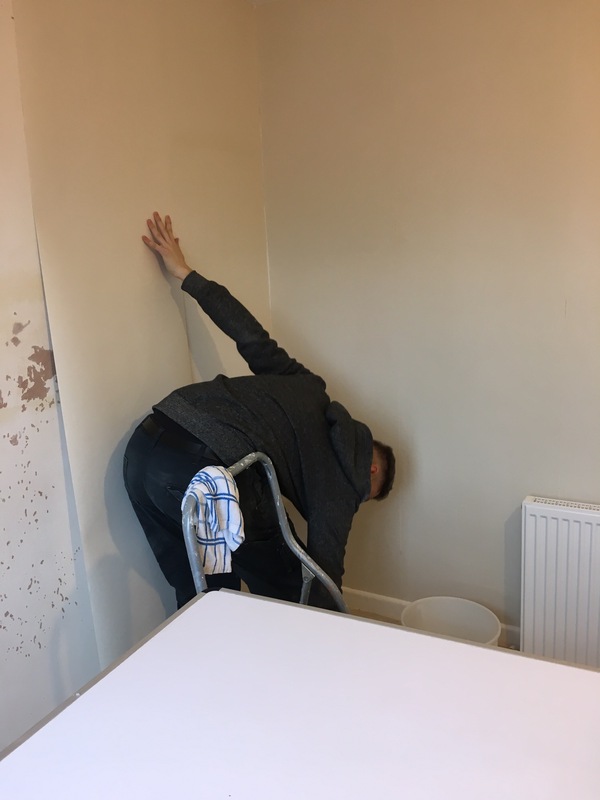 We have spent well over £200 on paint so far, got a date booked in next week for the carpets to be measured and on order for a couple of weeks time. 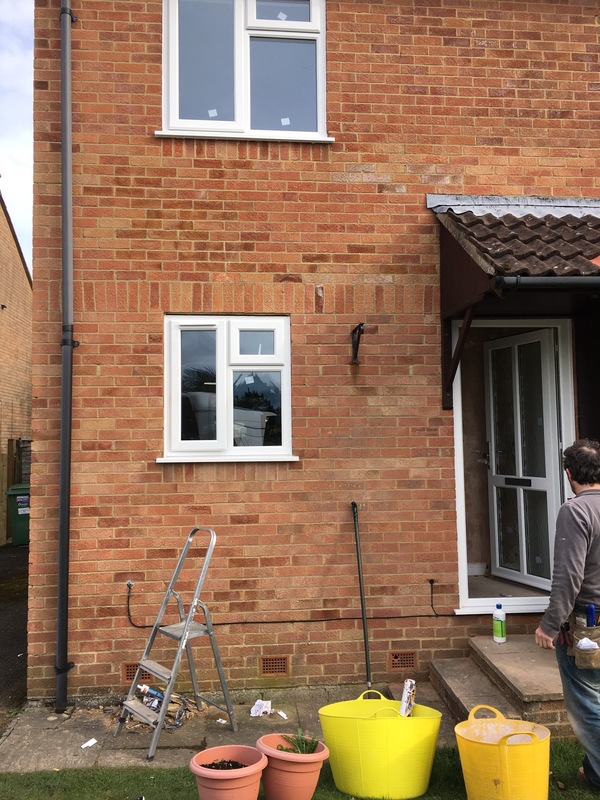 And we have now decided that we are going to get the double glazing put in our windows and doors so they are all getting ripped out and installed hopefully at the end of next week. The last two weeks I have felt like we haven’t really got much done but this week it is finally coming together. It’s so nice to see that hard work finally paying off and our house turning into a home. One big thing that has happened this week is out toilet literally fell off the wall. 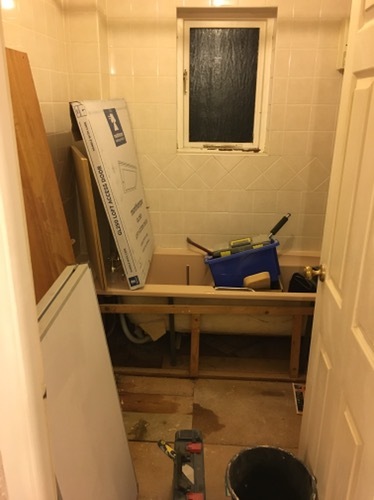 We knew already that it had a leak and that it looked like it had been taped up and not properly fixed, but since it has come off the wall we have been able to see the true damage in the bathroom. Everything needs ruling out and completely putting back in. The pipework is bodged as is he floor. We are hoping to get this done ASAP as in 2 weeks my parents fly out to Australia for 4 weeks so my Dad (our handyman) won’t be here to do any work for us. 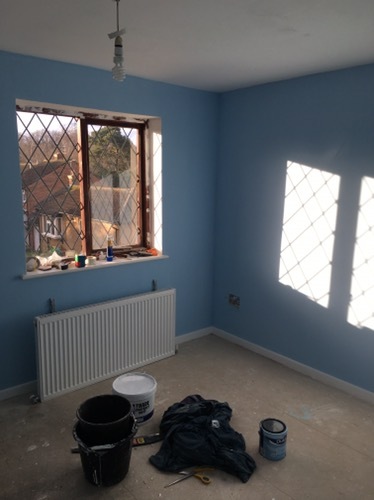 I’m hoping and praying by the end of next week we will have at least half the bathroom done, the windows and doors put in and a good effort of paint in the living room. I feel like we can see the light at the end of the tunnel now. I just hope it doesn’t take to long to get there. So this is the week I was hoping to get ALL the painting done, carpets laid upstairs and some of the furniture moved in. Unfortunately that isn’t the case. Things are taking a lot longer than we expected. The painting isn’t finished and the carpet is no where near ready to be laid. Unfortunately this means that we are not going to be in for Archie’s birthday next week. Even though this week feels like we haven’t got a lot done, we have. 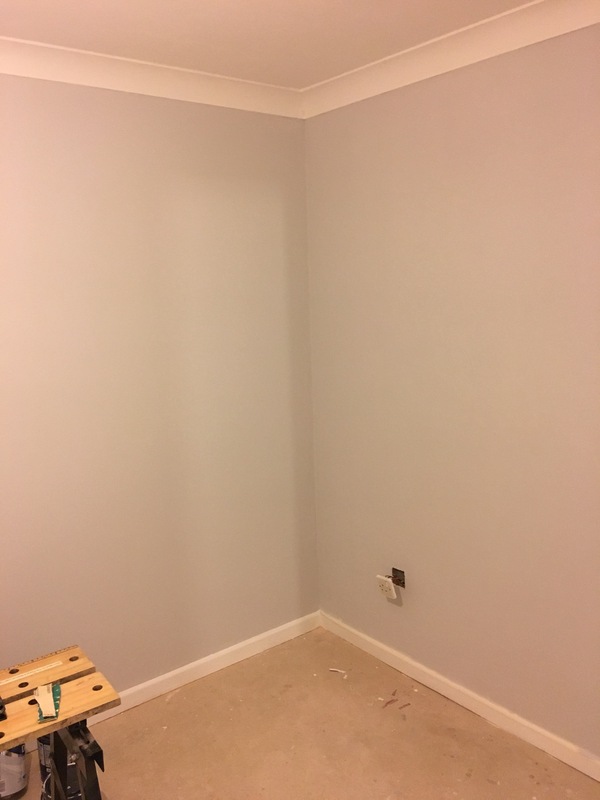 All the plastering is finished in the house now so we have been able to get some first coats of undercoat on a few of the walls in our bedroom. The skirting boards and coving all over the house have now been undercoated and glossed as have all the doors. 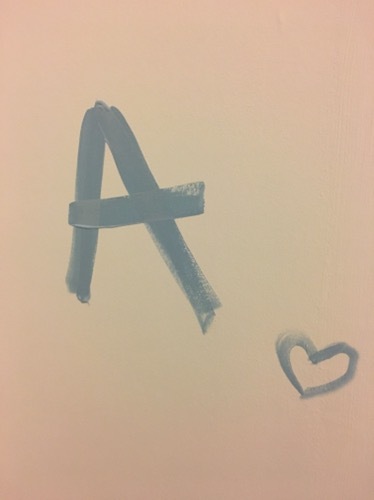 We have had a few issues with Archie’s room this week. I was hoping that come this weekend we would have it completely finished. 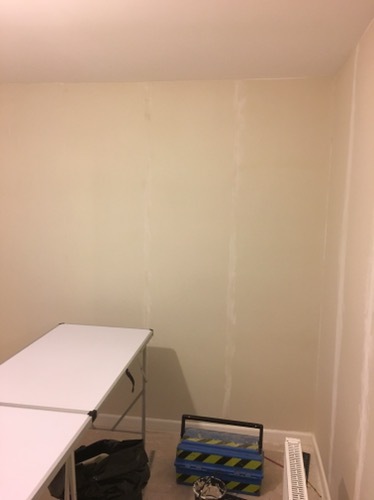 Unfortunately the lining paper hasn’t taken to the wall and has bubbled in places and has cracked. 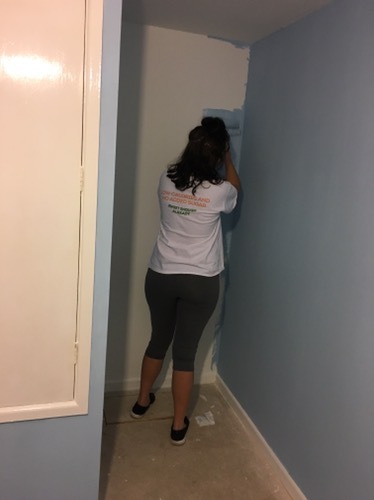 I’m not sure if this is because it has been applied wrong or what but we’re desperately trying to fix it without having to re do the whole room. I’m hoping by the end of next week we will have upstairs nearly finished and be starting downstairs. Callum lining paper Archie’s room.